Quorum Bio Co., Ltd was founded by dentists and professors of Seoul National University in 2013. In 2015, we have launched the [Lutooth teeth whitening kit] which was the first product of our oral health care brand ‘Lutooth’. 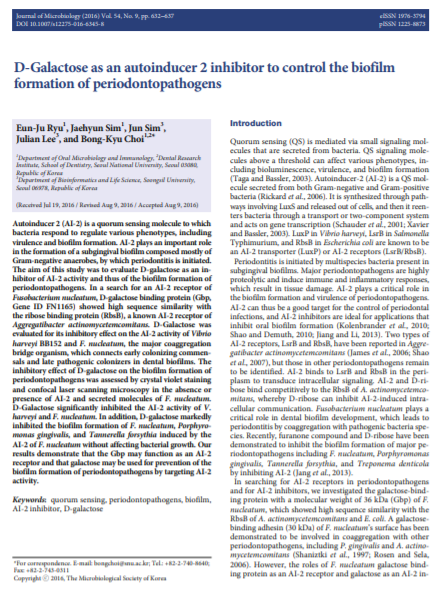 In addition, in 2016 we developed the world’s first quorum sensing inhibitor toothpaste through our outstanding research team which is composed of quorum sensing experts, professors and dentists of Seoul National University. We are planning to develop new medicine and products related with our outstanding quorum sensing inhibiting technology. We are specialized in quorum sensing inhibiting technology. We have the fundamental solution to prevent the arising danger of Super Bacteria which has resistance of antibiotics. Through our research we have discovered that Galactose inhibits quorum sensing between bacteria. In addition, we developed a method of mass production of Galactose by extracting it from milk. We have already launched the ‘Lutooth Quorum Premium Toothpaste’ which preserves good bacteria and only inhibits bad bacteria selectively based on our quorum sensing inhibiting technology. We will adapt our quorum sensing inhibiting technology to our upcoming disinfectant products and other oral care products for both human and pets. A Britain government report shows that in 2050, one person may die of antibiotics resistance of super bacteria in every 3 seconds. Which means Super Bacteria will be the number one cause of death in the future. Even nowadays 700,000 peoples are dying of super bacteria. There are many attempts to develop antibiotics to prevent super bacteria all over the world. To develop that kind of new medicines, it takes a decade. But in a short time, bacteria obtain resistance to these new antibiotics. Which is a frustrating fact for the developers. Bacteria have their own secret communication code named Quorum Sensing. And a recent research shows that biofilm which is the result of quorum sensing is the main cause of antibiotics resistance. So to suppress super bacteria it is requested to inhibit the quorum sensing stage between the bacteria not to form biofilm, instead of developing new antibiotics. Quorum Bio Co., Ltd has developed an inhibiting material of quorum sensing after years of research. Finally, we will begin to develop a new medicine which will suppress super bacteria due to our quorum sensing inhibiting material. Quorum Bio Co., Ltd has developed a method of mass production of Galactose which preserves good bacteria and inhibits bad bacteria selectively. By mass production of high purity/high performance galactose in a low cost, it will enable to add this quorum sensing inhibiting material to snacks, beverage even in candies. Which means people may eat those things without worrying about gum disease and cavity. This mess production technology will lead the human kind to escape from oral health issue. We have already launched the ‘Lutooth Quorum Premium Toothpaste’ which preserves good bacteria and inhibits bad bacteria selectively based on galactose.